News on our Single Track Bypass Hardware! As you know, our single track bypass hardware is patent pending for utility patent, and the news is that we're almost there with having it granted! Stay tune for the official news. The utility patent different from that of a design patent. In our case, the utility patent is on the concept of having two doors bypassing on one track instead of two tracks. Anyone trying to make two doors bypass on the same track using similar ideas, even if it doesn't look like ours, would be infringing on the patent. A design patent is how something looks, one would have to copy that design exactly to be infringing. What we have would be the utility patent. our stainless steel single track bypass on panel, chevron, pink doors we made to turn the back part of this basement a bedroom! We developed the Single Track Bypass Hardware because the double track one is too bulky looking. The balance between the hardware and the doors are lost. The heaviness of the hardware would be weighing on your eyes until you don't see the doors anymore :) The single track would create a cleaner profile, and less hardware to look at, or to tackle with. This image is from our studio. The Single Track Bypass Hardware seen here in the raw steel finish, Heavy Metal style. We have three main finishes for our hardware: Raw steel, stainless steel, and solid brass. In the raw steel, there are two styles, the Heavy Metal with straight hangers and arrowhead, with arrowhead hangers! Upon request, we can do a powder coated black on the raw steel hardware. All our hardware are MADE IN CANADA and are made by us! We are grateful for all the support from our communities in Canada and the USA. Let's keep it local! We like it that way! 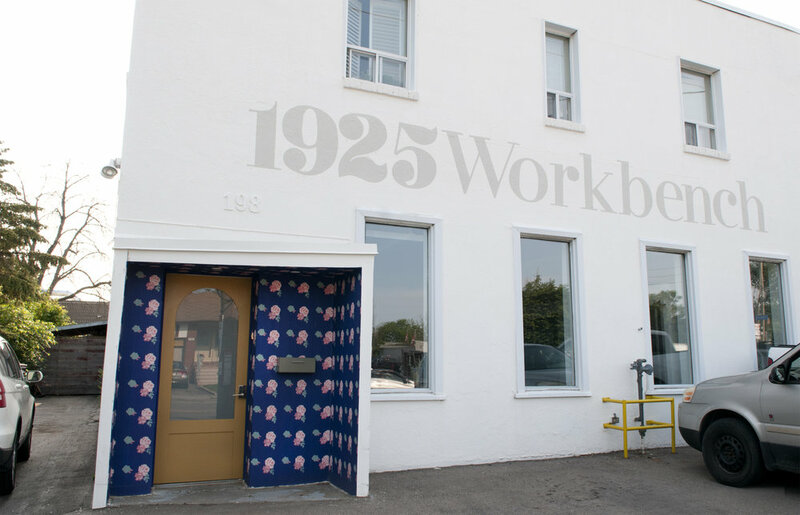 In June 2016, we found a charming white building in South Etobicoke that used to be a machine shop. The building belonged to the same family for 60 years. It was perfect for our brick and mortar, with the showroom in the front and the workshop in the back. The building came with this cute door cover in the front, and we thought it would be nice to have "wallpaper" painted on the inside of it. 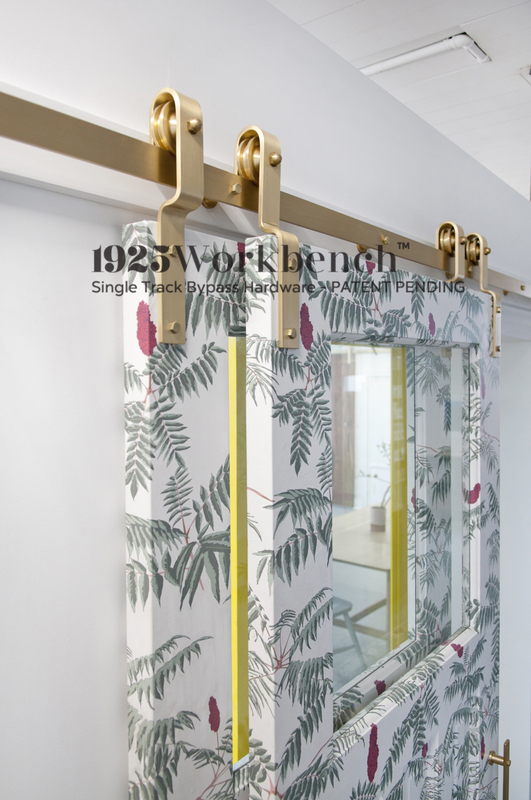 Because 1925Workbench started from our house, it would be a homey thing to do. We worked with Make Good Design and the result is fabulous! We decided to paint our name really big on the wall in light grey so that it's like a watermark on the building. it also helps with finding us. in our last location, no one can ever find where we were! We then set out to make every door, hardware and pieces of furniture you see in all the images here. As you enter the building through the mustard yellow door (which we also made), you'll see our showroom, it's minimal with colour. It's a place where I (My Le) love to spend time to work. We love plants, and on the left corner of this picture is our Guava plant we had for 6 years. Beyond the white oak doors on the left is the workshop, it's where the white walls and minimalism stop, and the chaos of creation begins. The photographs on the walls are my own. We aim to blend art and design, function and aesthetics. The black frame here are windows that belong to a large black door made of ebonized oak. Here a larger view for context. We've made movable walls so that if we wanted to change the layout in the future that it is possible. the wall with the yellow door here creates a section for bed. see in the next few posts. Here is our platform bed inside made of reclaimed wood. The left wall are electrical panels from the machine shop before us. we decided to leave them on the wall and paint them all white as an installation and to reclaim a piece of the building's history. View of the electrical panels. it is my favorite part of the showroom. my little work station using the walnut credenza. you'll see in the pictures below of the before, the space was slightly different. The big ebonized oak door slides on the I-beam that goes across the room. The windows open too, and that's what you saw in the picture above. 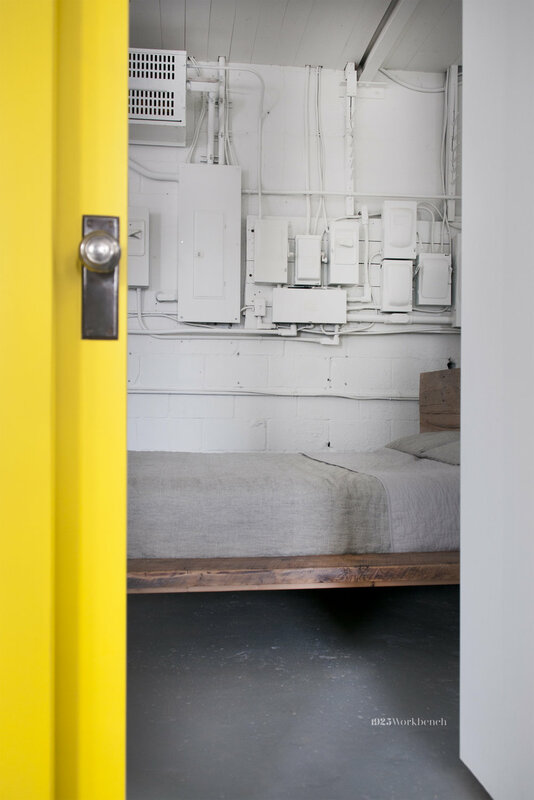 One view from the yellow doors where you see the daybed made of white oak, inspired by mid-day naps in Vietnam. Here is looking to the showroom from the workshop. Photograph on wall is my my le nguyen. This is the before of the spot where the pink doors and walnut doors are now. There's that wall with all the electrical panels that we painted white along with the rest of the space. Each of these control a machine in the old shop. They are now art for our showroom, taking back some history of the building. A more complete angle of the showroom before we did anything. I still love that industrial look. But it's a tranquil place now for quiet work and for our clients to come discuss their project. 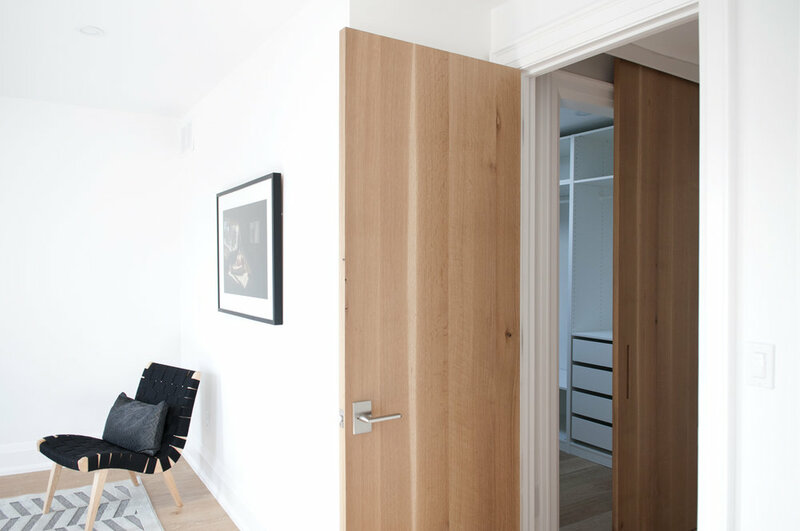 We recently finished solid white oak slabs doors for a third floor master bedroom in Riverdale, Toronto. These doors cover each of the openings on this floor: top of staircase, walk-in closet, bathroom, and the bedroom. A paradise in your own home. I had a little visit with the new NXL Architect office a few days ago at 31 Scarsdale Rd. We made the sliding doors that covers almost the entire strip of the office's right side where the board rooms are. 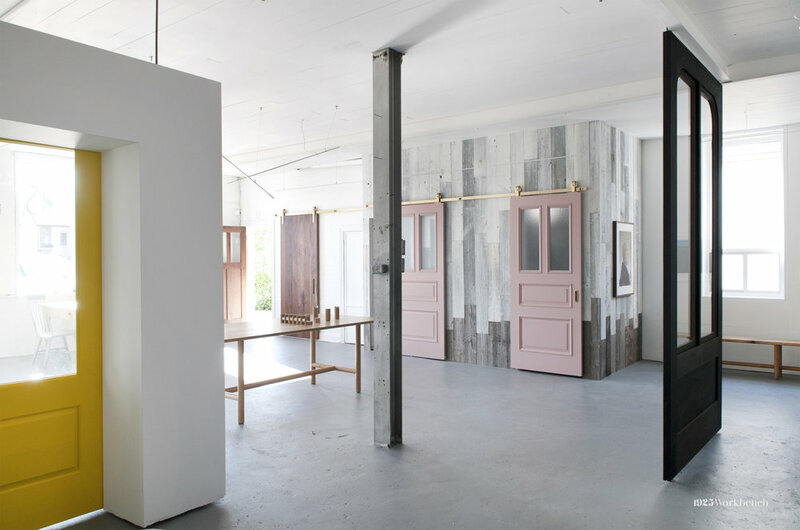 We even made the sliding hardware specifically for these doors as they were quite heavy being 2-1/4" thick of Baltic birch plywood with fluted glass panels. I couldn't be more happy to see such a beautiful office that seems more like a playground as it was done so thoughtfully and creatively. We are so proud to have worked on this project. The note book on the shelf above belongs to the principal architect's father. Four doors were installed for the large board room. Two are stationary on each side, while two slides in a bi-parting manner to open and close. A more frontal view of the board room with the four doors. These doors slide on the existing I-beam! The other set of doors is for a smaller think room. I felt like I was going back through time seeing this room amidst the modern, clean lines of the entire office. I took this picture of Rock while he worked on getting the doors installed months ago while NXL was under construction. Light through fluted glass is so beautiful. We made the hardware specially for these doors since they have to slide on the I-beam which had a thicker flat track. The wheels are metal instead of nylon to bear the weight of the doors. During under construction. Amazing what the space looks like now. When our client wanted to build another house beside their house for their son's family, they wanted a breezeway that would connect the two houses. But they didn't want to cover up the view or access to the backyard. So the solution is to put two large barndoors across the openings. And old factory in New Market has been turned info beautiful living lofts. 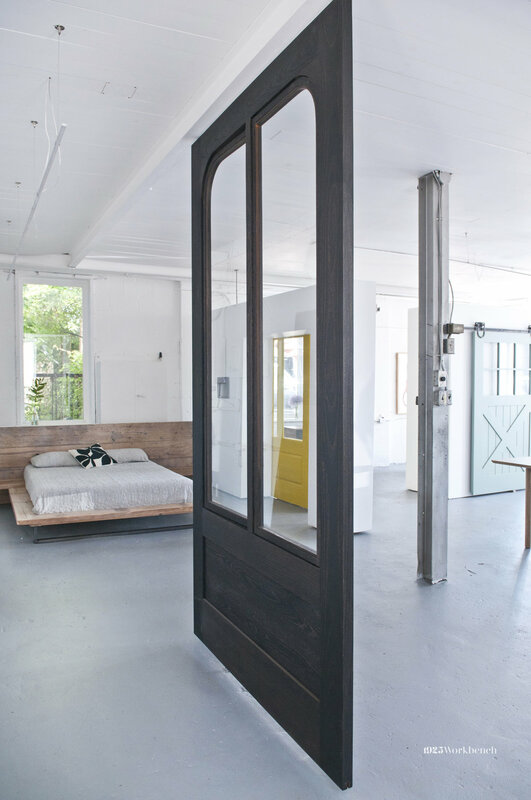 But what is missing in these lofts are the real barn doors that truly transforms the space. We retrofitted three openings in this two-bedroom unit, two openings with double doors, and one single door closet, and home couldn't be cozier. Our client just sent these pictures in. We made and shipped these doors and hardware to Windsor, and now that they are installed, they've taken over all the attention in the city. Now that we are in July and it's so hot, it makes me think about the bitterly cold day of December 1st when Sporting life Ottawa received 4 early Christmas gifts, 2 in red and 2 in black. The cottage feel that Sporting Life is known for has just top the scale once these four doors were installed. Somewhere in the hip Parkdale nestles a beautiful home with a lovingly put-together nursery for a baby boy. Wanting to add a classic beauty to the trendy loft, our client wanted the Chicago walnut doors to stand guard his bedroom. What a lovely choice. Located on a residential street minutes from Summerhill subway station, this amazing optical clinic (summerhilloptometry.com) will having you seeing all things beautiful! They have the most exotic and beautiful glasses frames I have ever seen. And all these frames are sitting there in this stunningly hip space---eclectic and elegant at the same time. And to top off the beauty of the space, Dr. Naeem has asked us to create doors to cover an unsightly nook that houses electrical panels. Wanting to replace a old sliding door for the front closet, our client asked for our opinion. After seeing the space, nothing speaks louder than a solid walnut slab door with horizontal planks on the stainless steel barn door hardware. At the end of the loft is a built-in bookshelf that was also made of walnut, so we thought we would have a dialogue going with the walnut pieces. As it turns out,the newly renovated kitchen area also has walnut cabinetry. Oh, and did I mention the art? Both Rock and I were so overwhelmed by the art in this loft that was hard to focus on the question at hand -- the barn door. It's like going to a gallery, except this was in someone's home, and so the curated collection was much more interesting . No wonder this loft was featured in Designlines magazine. The walnut flows nicely with the orange front door. The loft is being re-design by Eduardo and his team at www.aagency.ca. I like the orange so much I called Eduardo to ask for the code. We ended up painting the door we displayed at the Interior Design Show this orange.